Over the last few days, I have looked at how URLs and image adverts can help in increasing the click through rate of your PPC adverts. This helps in bringing the point forward that it is the tweaks you do to your campaign that ultimately will have the biggest impact. The previous two articles do not tell you to drastically change your campaign or it’s approach to PPC. Instead, they tell you to tweak the URL or possibly introduce image adverts. For this reason, another way you can improve your CTR is through simply ‘tweaking’. Another name for this is experimenting. Whatever type of PPC campaign you have and market you are targeting at, you can always experiment in PPC. In actual fact, it could be seen that experimenting in PPC is a necessity for optimum success. However, what reasons are there for experimenting in PPC? The internet and websites like PPC.org cover most likely (a complete estimate from myself!) around 90% of all the tips and tricks you can implement into your campaign. The rest of the ‘tweaks’ being the leftover 10% can only really be found through experimenting. Every campaign is different. Therefore, different experiments will provide different results to the campaign. Sooner or later, you will find an experimental tweak that will benefit you. Through experimenting, you will learn more about pay per click advertising and the type of campaign you have running. Experimenting helps in recognizing the flaws in your campaign and the ways of improving them. As you can see, experimenting is a must-do for PPC advertisers. It can benefit them in so many different ways. Once you know you are going to experiment on a campaign, you need to know the key areas to experiment in to increase your PPC advert’s CTR. But, before you do anything, make a duplicate campaign to perform your experiments on. From doing this will let you resort back to your original campaign if your experimenting causes negative results. A major factor you can experiment on that will effect the advert’s CTR is the text advert itself. We have already looked at how the URL can increase your CTR. Now, it is time to experiment on the two other areas of a text advert: headline and description. Try different combinations and include different information into the advert. You may find your persuasive techniques are not gaining you clicks and therefore you would find it useful to experiment through including power words into your advert. The possibilities of experimenting on a text advert are endless. The keywords help to target the publisher websites you want your advert to be on. This, in turn, will affect the CTR. Therefore, experiment and choose different keywords for your campaign. Choosing the wrong keywords will definitely reduce your CTR because you are displaying your advert to web users not interested in the contents of your advert. Try and find out the right keywords for your campaign. 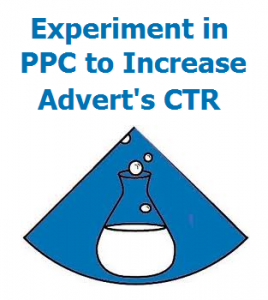 Some advertisers will see that experimenting with the CPC will have no impact on the CTR of the advert. However, it will have quite a large impact. A high CPC will help the advert get displayed on higher page rank websites while also making the advert appear at the top of the page above the crest. On the other hand, a low CPC will have the opposite effect. Experiments should be carried out to find what CPC provides the best CTR result at the most cost efficient solution. I hope this makes clear how important experimenting is to PPC. Without it, there is no means of improvement: experimenting helps to distinguish a good PPC campaign to an excellent one.